Savvis has been hosting eCommerce platforms for nearly two decades. Internet retailers including easyJet and Hallmark Digital trust us to power their online success. Savvis offers a comprehensive portfolio of infrastructure, network and application management across the eCommerce ecosystem. No matter what you sell or where you are along the eCommerce journey, we can support your commercial goals with the speed of implementation, accessibility, security and affordability of a retail-ready cloud environment, with our Virtual Private Data Centre. 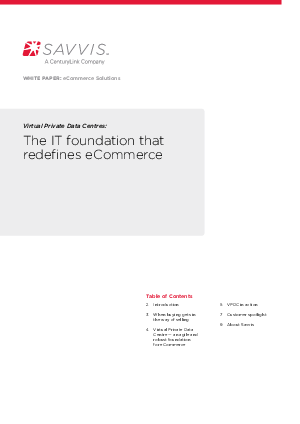 Combined with our global data centre footprint and network options ranging from Tier1 public IP access to private, low-latency connectivity, the VPDC offers a resilient, made-to-measure solution for any eCommerce application.